WannaCrypt attacks ← Readycrest Ltd. The ransom is $300 and you’ve got 3 days to pay before it doubles to $600. If you don’t pay within a week then the ransomware threatens to delete the files altogether. 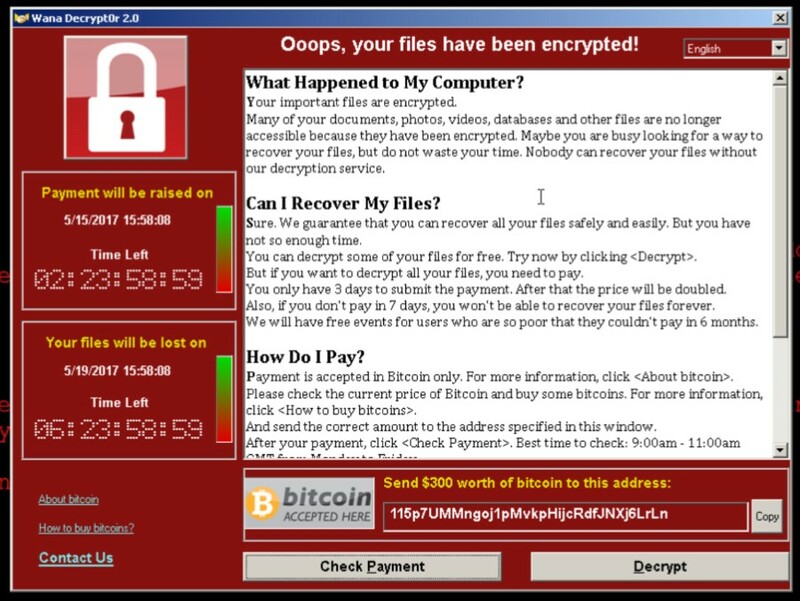 Note the “Wana Decrypt0r” title on the window below: the three terms WannaCry, Wcry and WannaCrypt are all referring to the same piece of malware, they’re merely various representations of the same name. In March, Microsoft released a security update which addresses the vulnerability that these attacks are exploiting Microsoft Security Bulletin MS17-010. Microsoft Security Bulletin MS17-010 – This security update resolves vulnerabilities in Microsoft Windows. The most severe of the vulnerabilities could allow remote code execution if an attacker sends specially crafted messages to a Microsoft Server Message Block 1.0 (SMBv1) server. The security update addresses the vulnerabilities by correcting how SMBv1 handles specially crafted requests. Note – Microsoft has taken the highly unusual step of providing a security update for all customers to protect Windows platforms that are in custom support only, including Windows XP, Windows 8, and Windows Server 2003. Customers running Windows 10 were not targeted by the recent attack.